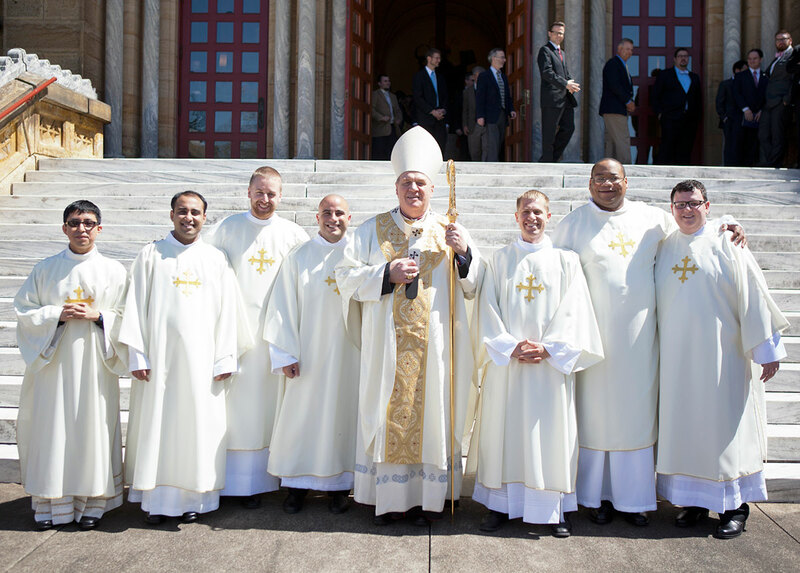 On April 11, Archbishop Joseph W. Tobin ordained seven men as transitional deacons for service to the Church in central and southern Indiana. The ordination liturgy was celebrated at the Archabbey Church of Our Lady of Einsiedeln in St. Meinrad. Those ordained are deacons Nicolás Ajpacajá Tzoc, James Brockmeier, Anthony Hollowell, Douglas Hunter, Kyle Rodden and Matthew Tucci for the Archdiocese of Indianapolis, and Meril Sahayam for the Diocese of Palayamkottai, India. Deacons Hollowell and Tucci are receiving their priestly formation at the Pontifical North American College in Rome. The other deacons are enrolled at Saint Meinrad Seminary and School of Theology in St. Meinrad. The Diocese of Palayamkottai has a special relationship with the archdiocese and Saint Meinrad, where some of their seminarians receive their priestly formation. 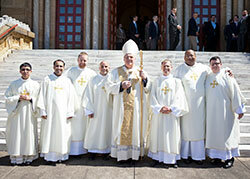 Several of their priests serve the archdiocese for a few years before returning to their home diocese in India. Deacon Sahayam will be ordained a priest in his home diocese in 2016. All six deacons of the Archdiocese of Indianapolis will be ordained to the priesthood on June 25, 2016, at SS. Peter and Paul Cathedral in Indianapolis.